A simple and effective concept delivering outstanding, reliable DHW performance. 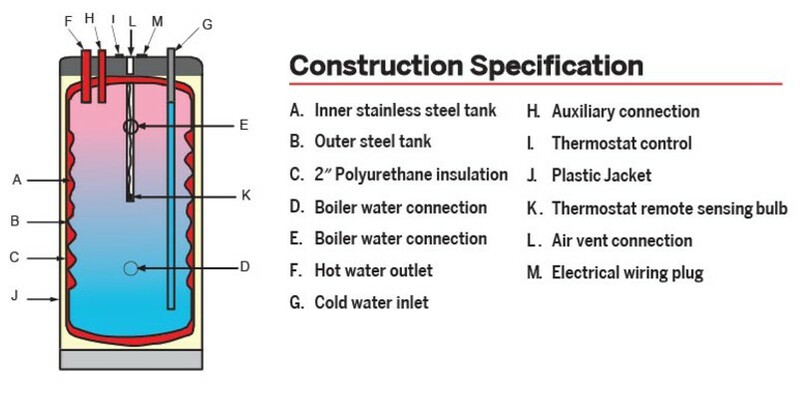 Why a Stainless Steel tank? The Tank-in-Tank is a stainless steel hot water tank (cylinder) entirely immersed within an outer tank which contains the primary water. The corrugated inner stainless steel tank forms a large heat exchange surface that can heat the domestic hot water in a very short time. The outer tank is covered with a high-quality insulation, protected by a shock resistant plastic jacket. The decision to use stainless steel for the manufacture of the "Tank in Tank" was made in the 60's. It was chosen for its well established reliability and advantages over other materials, namely: Stainless steel is stable at elevated temperatures above 180ºF, which is not the case for tanks manufactured from mild steel protected by a glass lined coating. It is for this reason that some manufacturers include a clause in their guarantee limiting the DHW storage temperatures to 140°F or even 130°F. Stainless steel, as its name suggests, is resistant to corrosion. The protective coatings in an enameled tank can be damaged by a shock during transportation, unloading or maneuvering it into position. This is not the case with stainless steel. Last, but not least, a stainless steel tank does not need a sacrificial anode. This is a major advantage versus conventional water heaters. Stainless steel is also universally recognized for its hygienic properties and is frequently used in the manufacture of items for the food industry and for surgical instruments. There is little chance of its use being questioned on the basis of it being a health hazard. Conversely, protective coatings, i.e. enameling cannot be examined everyday and their failure could lead to unhealthy consequences. When the thermostat in the inner tank calls for heat, the boiler and circulator start. Boiler water is circulated around the outer tank and heats the domestic water in the inner tank. 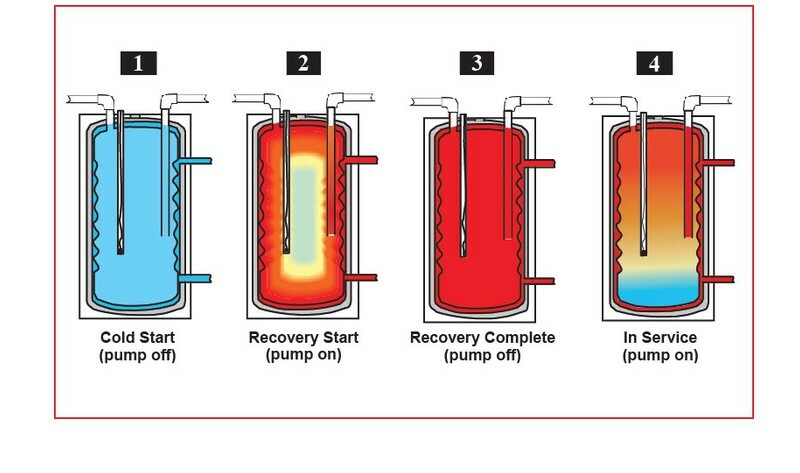 After transferring its heat, boiler water is returned to the boiler to be re-heated. When the thermostat in the inner tank reaches its preset mark, the boiler and circulator shut off. Water contains dissolved minerals such as calcium-carbonate, magnesium, silica, iron and phosphates. When water is heated, it undergoes a chemical reaction that causes these dissolved minerals to precipitate out as solids. These solid minerals (specifically calcium and magnesium) are called lime-scale. Lime-scale is a poor conductor of heat. If lime-scale collects on the heat transfer surfaces of a water heater's heat exchanger, it insulates the heat from the water. This means less heat is transferred into the water and more money is spent heating the lime-scale instead of the water. Triangle Tube's Indirect water heater's were specially designed to prevent the formation of lime scale on the surface of the exchanger, thus retaining high performance throughout the product's lifetime. Thanks to the exceptionally large heating surface area (typically 1.5 to 2.5 times greater than a coil), Tank-in-Tank systems can use the whole heating power of the boiler. Consequently the Tank-in-Tank can heat a large quantity of domestic hot water in an exceptionally short time. As a result of this rapid heating capacity, the volume of stored water can be reduced and energy loss kept to a minimum. Furthermore, condensing boilers benefit from being able to work in condensing mode for much longer, giving much greater fuel efficiency. The tank is free to expand and contract as a result of the variations in pressure which occur with every hot water draw-off. The corrugations amplify these movements and prevent the formation of lime scale on the surface of the exchanger,which retains its high performance throughout its service life. The Tank-in-Tank requires no anode protection and the self-descaling feature eliminates the need for regular descaling. A primary coil is not required and there is no need to worry about contamination, leaking and sludging caused by cracked linings. Natural turbulence across the concave base keeps particles in suspension, preventing formation of sediment and - aided by consistently high store temperatures (above 140 F) - helps to avoid growth of legionellae bacteria. In a tank with a coil, the water at the bottom remains tepid; so the legionellae can survive and multiply.